This entry was posted in Auto, Not a Lambretta and tagged badge engineering, Hanway Motors, Scomadi by crocodilejock. Bookmark the permalink. Even an electric lambretta!! And what about the characteristic noise and smell that we are used to?! Wouldn’t be the same would it Hugo! There would have to be a integrated speaker, and maybe a device that drips the odd drop of two stroke oil onto something hot! By the way: I finally drew some lambrettas ( despite all the beautifull exposed vespas!! ) and dedicated it to you: http://wp.me/pLtki-1O0 ! Did you see it? 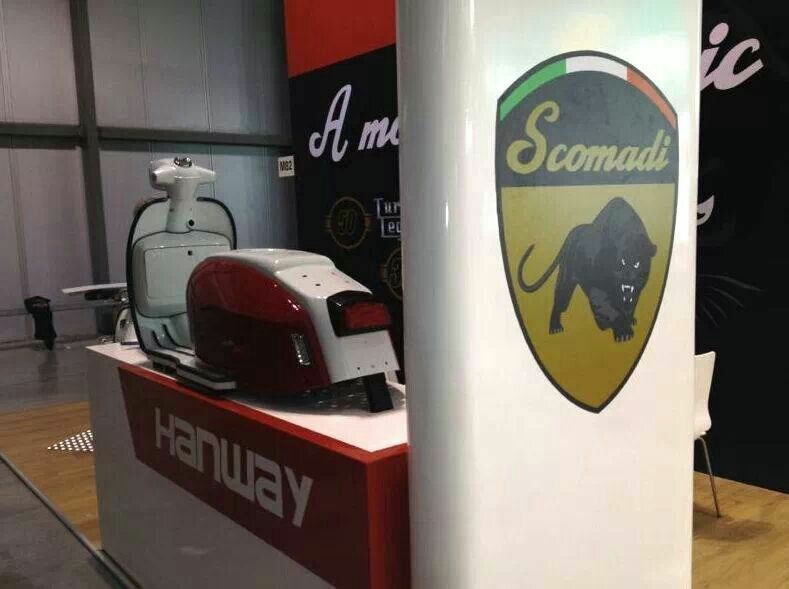 I have heard the 300 cc model is not being produced as Piaggio will not put their engine in any scooter from China,also Scomadi have done the dirty on Piaggio as they have had Hanway attempt to copy the Piaggio 300 engine which Piaggio then found out about and are now looking to sue Scomadi. lt’s just as bad as Scomadi having Italian script on their badges and the use of the Italan tri_color, why don’t they use the Chinese flag. Innocenti must be turning in his grave along with Bertone .Scomadi no thank you. I heard the rumour a few weeks ago that Piaggio were in the process of taking scomadi to court about having the 300 engine copied in china, and telling customers it was a piaggio unit in the scomadi which wasn’t the case. I really like the concept but having seen a 50 cc version i agree the quality is to the standard of most items from china, you can’t beat european build quality. The trouble with scomadi is they are looking to cash in on a market of the younger less experianced scooter riders, just because it looks like a lambretta doesn’t make it a lambretta, it’s just another chinese copy and as far as all the people i know who ride lambrettas thats all it will be a poor copy of the worlds finest scooter, i’de sooner have a vespa !!! I heard it was PIaggio that pulled the plug on the use of their engine unit and that Hanway or other Chinese companies had been approached to copy and build the 300cc engine.It then esculated that Piaggio would no longer supply new engines for the current models being produced and have instructed their lawyers to take proceedings out against Scomadi over copyright of their engine,so it now looks that no European engines will be used on any new scooters.When you go on the Scomadi site it’s all gone quite on the 300 engine front. It now seems that ony the 50 and 125 are available even though Scomadi attempted to fund the 300 via crowd funding,funding the build to copy the Piaggio engine and then pass it off as a Piaggio built engine but made in China. Sad as I knw of a lot of guys are holding out for the 300 to be launched, even deposits have been paid and now this. I knew it was to good to be true,stick to my SX me thinks.